, PC/Mac data recovery software and cell phone data recovery app, etc. how to recover lost data from ipad? How to recover lost data from iPhone after factory reset? Summary:"USB ports not working" lies with the USB ports and not with any particular device.The Bitwar Recovery can help to solve the problem. Summary:Free download external hard drive repair software for Windows 7/8/10 or Mac to recover data without losing data or recover data from quick format, accidentally deletion, corruption, etc. How to free recover a formatted SD Card? Summary:Summary: We have known that the SD cards are very much convenient for storing beautiful photos, files, favorite music or videos. However, what if the SD card was accidentally formatted? Summary:Bitwar Data Recovery support mistakenly deleted hard disk File recovery, incorrectly falsely deleted data, mistakenly empty the Recycle Bin files. Bitwar iPhone Data Recovery is best iOS Data Recovery software allows you to recover all the lost or deleted files from windows or mac OS. Some day when you're unfortunately facing data loss issues on Mac, feel no hesitated to download this software. iOS devices includes iPhones, iPad, iPod which becomes more popular every year, data stored on iOS devices are considered secure and safe, and are definitely becoming more and more complex. If you ever accidentally deleted or lost valuable data on your iPhone, what should you do? For recover lost data from mac, you should install best iOS data recovery software. Bitwar iPhone Data Recovery is a fast, reliable and best iOS data recovery software which has friendly user experience and wizard operation. It is designed for the Windows/Mac operating system to get back your iPhone/iPod/iPad lost messages, contacts, Call logs, videos, photos and more. It delivers safety, accuracy and completeness of data recovering for iOS devices, even allows you to preview and select data for recovering. ●Deletion - Accidentally delete contents stored on iPhone, iPad or in apps. ●Virus Attack - Hit by harmful mobile viruses like malware, spam, and ransomware. ●Locked Device - Forget password to unlock your iPhone, iPad or iPod Touch. ●System Crash - iOS upgrade/downgrade failure may bring about data loss. ●Damaged Device - A device is damaged, but iPhone/iPad or iTunes backup is available. How to recover lost data from IOS device? To recover lost data, you need to install iTunes and Bitwar iPhone Data Recovery on your Windows/Mac. ITunes can provide modules support for Bitwar software. And Bitwar iPhone Data Recovery can help you to recover data back. There are two ways to recover lost data with Bitwar iPhone Data Recovery, “Recover from iOS device” and “Recover from iTunes Backup”, choose one of them is good. First of all, we introduce “Recover from iOS device” with Bitwar iPhone Data Recovery. When both iTunes and Bitwar iPhone data recovery were installed, start the Bitwar iPhone data recovery program and connect your iOS device to the computer via a dedicated USB cable. Select the default recover mode "Recover from iOS Device". After the program has identified the connected device, it will jump to the Select File Types page automatically. Select the type which you want to recover data and click “Start Scan”. The software will quickly scan the iOS device to find all the existing and lost files of the type. You should keep your iPhone connection during operation. You can also “pause” or “stop” the Scanning process to preview data. When the scan is finished, all lost data of the file type you selected will be list out, you can preview them, then mark the data what you want and click "Recover" button to save them on your computer very well. According to the above operation, the lost data has been successfully retrieved. If you have backup iPhone’s data with iTunes or your iOS device has damaged, however, you want to see the data. 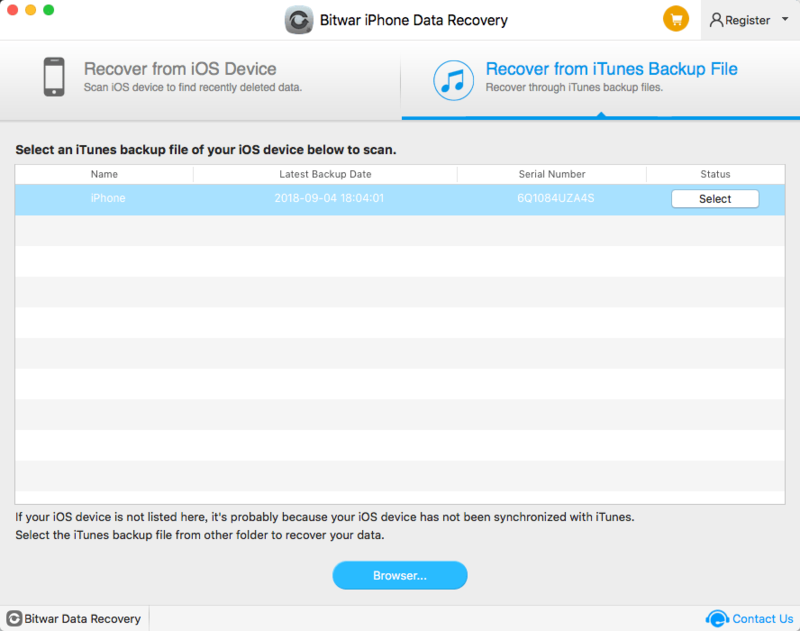 So please select “Recover from iTunes Backup File” when you launch the Bitwar iPhone data recovery. Start the Bitwar iPhone data recovery program and select the recovery mode "Recover from iTunes Backup File", then select the backup file which you want to recover data from. If the backup file is not displayed, You can manually find your backup file by click “Browser...”. Note: **** is the login name for users login system, such as Administrator. After you selected the backup file, the program will ask you to the Select File Types. You can select one, multiple, or all file types, and then click “Start Scan”. The program will scanning iTunes backup to find all the existing and lost data quickly. Once scan finished, You can find the scanned data showing on window and also the software offers the type filters in the left panel, double click the file to preview, finally, select out all the iOS data you desire and get them back with one click on "Recover" button. Here you need to specify a folder to save the recovered files on your computer. Recover from iTunes Backup File also has recovered the lost data of the iPhone successfully. As you can see, no matter recover from which mode, it is easy enough to recover lost data with this best iOS data recovery - Bitwar iPhone Data Recovery. Now, download this powerful program and try it? Summary：What is an iOS device? If you accidentally lost your important data from iOS device. Free download Bitwar iPhone Data Recovery Software to recover lost data from iOS device. Summary：If you forgot your Google password or username, or you can’t get verification codes, follow the Gmail recovery steps to recover your password. The Bitwar Recovery is the best solution to fix the data loss of the request failed due to a fatal device hardware error. What's New on Bitwar Data Recovery for Windows 6.4.7? What's New on Bitwar iPhone Data Recovery for Mac 2.2.0? What's New on Bitwar Data Recovery for Mac 3.3.0? Copyright © 2014-2018 WWW.BITWAR.NET All Rights Reserved. , data recovery freeware, Photo recovery Software, SD memory card recovery software and iPhone/Android phone recovery software, etc.